1. The radio operates on the standard 1920s superheterodyne design. 2. The front panel measures 30” long by 7” high by 3/16” thick. 3. Radio Service Labs IF transformers (and possibly oscillator coupler?). 4. General Instrument Corp “No Loss” tuning capacitors with Accuratune dials. 5. Rauland “All American” audio transformers. 8. Silver-Marshall antenna coupler and Type 275 choke coil. 9. Connecticut Telephone and Electric Co. “Triple Range Variable Condenser” Type D-10 (tunes the filter transformer). 10. Allen-Bradley rheostats to control the individual tube filaments. Rear chassis view of the Wilson superhet. The professional contruction is evident. Most of the components on the front panel and the chassis basepanel were mounted with screws through tapped holes (very few of the screws had nuts). The basepanel had extensions for the various terminals that protruded behind the back of the cabinet. The knobs for the filament rheostats and the grid-leak detector were all identified with engraved letters. Maurice A. Wilson paid attention to the finer details and he was a skilled builder! Close up view of the RF front end and the IF amplifier. I have four different antenna coils for the radio; the one shown in the bottom right of this photo is the lowest frequency range of the four. The slide switch on the left side of the oscillator coupler changes its frequency range by changing taps on the largest coil; the amount of coupling of the pick-up coil is controlled by the small lever. The round box with a dial (next to the antenna coupler) is a triple range variable condenser for adjusting the peak frequency of the filter transformer. All four of the IF transformers were bad and they needed to be repaired. For two other examples of a superhet using some of these same components click here. Inside view of the filter or “input” transformer. The secondary winding is the largest coil next to the screw terminals and the primary coil is the smallest coil. 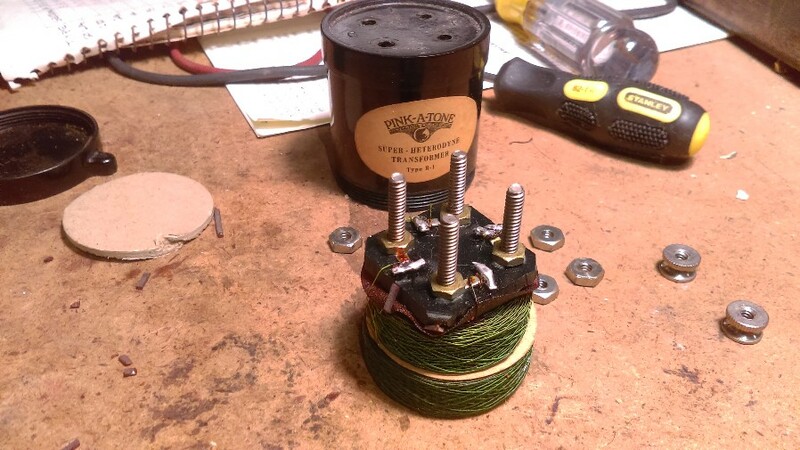 This transformer fared much better than the other transformers because it was bound together with twine, but I still needed to unwind some of the secondary wire because there was an open in the wire several layers into the coil - a freak wire from the factory that I am sure frustrated Mr. Wilson. Bottom view of the Radio Service Labs IF transformers, identified with the Type RT __ designation. All of the IF transformers showed various signs of being repaired, probably in the early existence of the radio. One sign was the markings on the bottom of the transformers (the transformer shown here, number three from the first detector, has a “1” penciled on it, and a different style “2” scratched on it). Other markings were an “Input” scratched on number one, a single “2” on number two, and a “3” and a “1” on number four. The main problem seems to be with the way the transformers were manufactured. The secondary wire is very fine and the two coils were held together with small rubber bands. The rubber bands would break and the coils would thence move around, breaking the tiny wires. Little remained of the rubber bands when I first saw the insides of the transformers. Two of the transformers had small pieces of newspaper stuffed in their bottoms to help cushion the coils. This is a scan of one of the pieces of newspaper stuffed in an IF transformer. Leo Reisman and His Orchestra produced For My Sweetheart on July 12, 1926. This approximately sets the date of the transformer repairs. I left the pieces of newspaper in the transformers as part of the history of the set. Photo courtesy of David Willenborg. 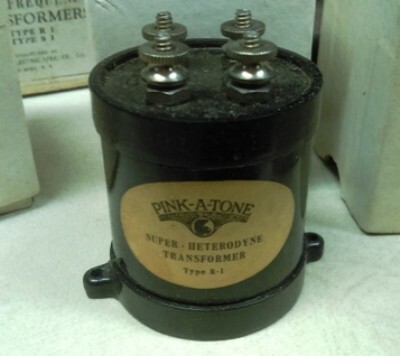 Here is a photo of the internal construction of a Pink-A-Tone R-1 IF transformer. This is exactly how the untuned IF transformers in the Wilson superhet looked. David had to repair all four of his NOS transformers because of broken wires etc.. Another problem with these transformers is the connection beween the nuts and the small lugs - the formica plate tends to shrink over time because of pressure and the connection between the nut and the lug loosens up. At least that’s the way it was with my transformers. Even though these transformers seem to have their fair share of problems, they can be opened up and be repaired fairly easy. Just unscrew the bottom plate and remove the nuts from the screw studs and the transformer is free. Photo courtesy of David Willenborg. The following table lists the pass band properties of the Radio Service Laboratories IF transformers. All of the transformers were tested out of the circuit with the secondary referenced to A-. Since the average frequency of the three untuned transformers came out to be 248 KC, this frequency was used to test the filter transformer. The triple range variable capacitor was adjusted to get resonance at 248 KC. The primary of the filter transformer was 246 microhenries and it took .00161 mFd to resonate at 248 KC (a .001 mFd fixed capacitor in parallel with .00061 mFd capacitance from the triple range condenser - 68 on its dial). The following table records the resistance readings of the Pink-A-Tone IF transformers, courtesy of David Willenborg. Advertisement for the Radio Service Laboratories RF transformers, from the February, 1923, Radio News magazine (photo courtesy of Rich “sansfil” via the Antique Radio Forum, Dec. 10, 2014). The transformers in this advertisement are meant to be wide band in order to cover a wide range of RF frequencies. The IF transformers, as in the Wilson superhet, were manufactured some time after these transformers and were meant to be for a small range of frequencies (20 KC to 30 KC bandwidth). Close up view of the audio amplifier section of the Wilson superhet. All of the audio tubes have automatic current limiting resistors for the filaments instead of rheostats. This is a first draft for a schematic diagram of the Wilson superhet. The set will work with an internal antenna coupler or an external loop, controlled with a small switch at the bottom of the Wilson nameplate. Regenerative amplification is controlled with a small variable capacitor above and to the left of the Wilson nameplate (regenerative amplification in the first detector only works if the internal antenna coupler is used). Rheostats control the filament voltage of the first detector, the oscillator, the three tubes in the IF amplifier, and the second detector; the volt meter will measure any of these filament voltages depending on the position of the tap switch. The filaments of the tubes in the audio amplifier are only used if the appropriate jack is used. The milliammeter seems to be wired incorrectly as it only measures current in the first audio tube. Close up photo of the Wilson nameplate. The dial was in perfect shape when I purchased the radio but the glass got cracked during shipment. Oh well, I guess it could have been worse. I will have to replace the corroded screws. I didn’t notice how bad they looked until I seen this photo. Little is known about Maurice A. Wilson. I was getting conflicting dates of his birth in the 1890’s and conflicting dates of his death in the 1970’s. He did work as a Chief Draftsman for a steel company, and that probably explains the highly detailed Wilson nameplate shown here. I think he was a perfectionist in everything he did with this radio!.